"Little Bay, a small town situated 12 miles from Springdale, was originally called Indian Bight. Considering the number of Beothuk artifacts found in the Green Bay area. 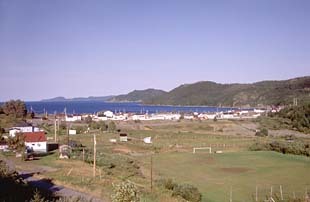 Little Bay was probably the site of a Beothuk encampment. 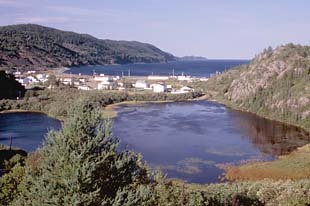 In 1878 a fisherman from Wild Bite (now Beachside) by the name of Robert Colbourne was hunting caribou in the area that would become Little Bay. While tracking one of these animals, he noticed a piece of copper ore sticking out of the mossy ground where the animal had been grazing. When word got out about his discovery. Dr. Henry Eales of London and Adolph Guzman of the Betts Cove Mining Company, who owned the area's mining rights, forced Colbourne to disclose where he made his discovery. For this valuable information, Mr. Colbourne received but ten pounds sterling, a tub of butter and a chest of tea. While the mineral deposit's discoverer continued his meagre existence, Betts Cove Mining Company proceeded to grow very rich mining the local ore. On July 27, 1878, a geological surveyor by the name of James Howley arrived at Indian Bight. At that time there were no people living in Little Bay. Two months later he returned to a different Little Bay. He said it was a "pretty little town ... houses were being built for the accommodation of the miners now numbering over 5,000 individuals." 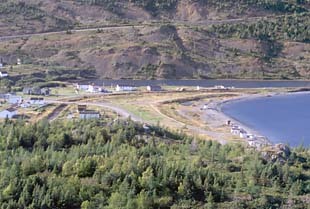 It is plain to see; it took but a few months for the town of Little Bay to become a thriving mining community. People came from all over the world to get a piece of the copper pie. With so many people pouring into the area in such a short time, there was bound to be scandal and intrigue. So much so, that Little Bay was dubbed The El Dorado of Newfoundland."